Your kids will love this Chicken Tortilla Soup recipe. It also makes a great dish for a Mexican theme party or a light supper or lunch time snack. You can add more or less of the hot stuff according to your preference. 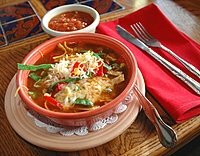 As with many a Mexican Chicken Recipe, the sour cream makes it rich and creamy and mellows the spices. This Mexican Chicken Recipe makes enough to serve 4 people. chopped cilantro or parsley to garnish. Heat the oil in a large saucepan, saute the onion,garlic and chillies until they are silghtly softened. Add the next 8 ingredients and bring to the boil, simmer for 20 minutes. While the soup is simmering, lay the tortilla stripson a baking tray and lightly brush with vegetable oil. Bake the tortillas until crispy at 400 degrees F / 200 degrees C, turning frequently - try not to snack on any. Back to the soup: After 20 minutes add the chickenand cook for a further 5 minutes then stir in the sour cream. Serve your yummy Mexican cuisine in soup bowls and garnish with the baked tortilla chips, grated cheese and cilantro or parsley.